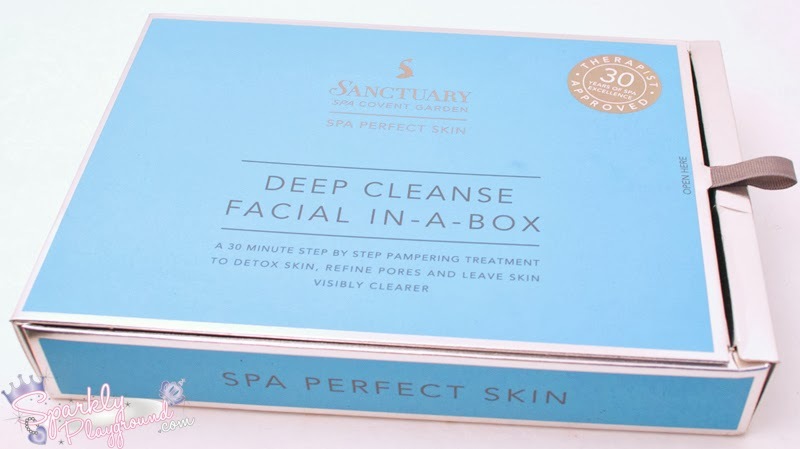 A 30 minute step by step pampering treatment to deep cleanse skin, refine pores and leave skin visibly clearer. 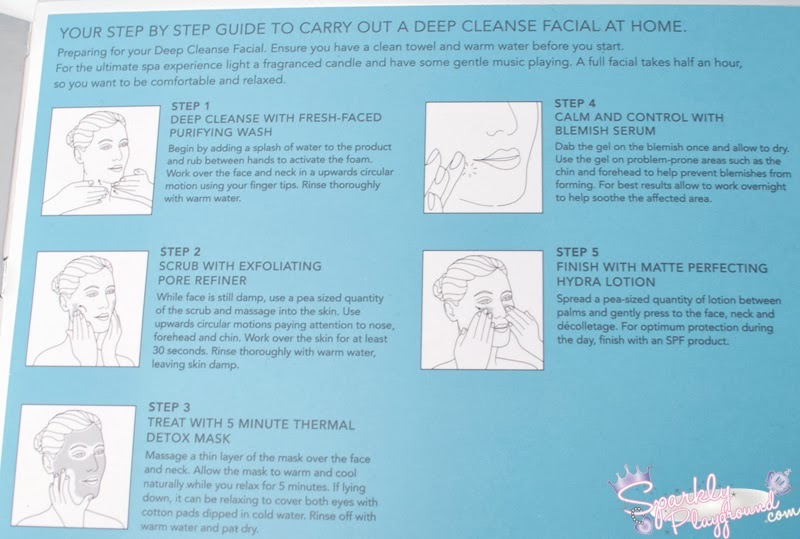 Designed to be used together, each product in the Deep Cleanse range is enhanced by the others. Although our professional formulations work best with repeated use, taking the time to do a full facial means you’ll notice a visible difference with fresher, hydrated and visibly clearer skin. Discover your 30 minute Sanctuary. Ensure you have a clean towel and warm water before you start. 1 Deep Cleanse – the first step in a thorough cleanse, this gentle foaming wash melts way even stubborn mascara while leaving skin feeling conditioned, smooth and soft. 2 Exfoliate- helping to prepare the skin to receive other products and absorb them more effectively. This exfoliator helps to cleanse the skin while minimising the appearance of enlarged pores. 3 Boost – this detoxifying mask is great for congested skin. The warmth of this self heating mask helps to open up pores so the charcoal and kaoline clay can help draw out the impurities from deep within the skin. 4 Targeted Treatment – for those with problem prone areas. This fast acting recovery gel helps to calm, control and speed recovery. With a concentrated blend of botanical extracts which encourage cellular renewal, blemishes don’t have a chance. 5 Hydrate & Protect – all skin needs moisture to stay healthy. This refreshing fluid is easily absorbed without clogging pores and gives targeted hydration where its needed the most. This lotion uses a concentrated blend of five fruits to help cell renewal and help increase your skins radiance. Aqua (Water), Sodium laureth sulfate, Decyl glucoside, Glycerin, PEG-7 Glyceryl cocoate, Hamamelis virginiana extract, Acrylates copolymer, Cocamide DEA, Cocamidopropyl betaine, Propylene glycol, Sodium chloride, Chamomilla recutita (Matricaria) flower extract, Glycol distearate, Polyquaternium - 47, Disodium EDTA, Tocopheryl acetate, Sodium hydroxide, Cocamide MEA, Laureth-10, Cucumis sativus (Cucumber) fruit extract, Citric acid, Pelargonium graveolens flower oil, Phenoxyethanol, Citronellol, Benzoic acid, Magnesium nitrate, Sodium benzoate, Dehydroacetic acid, Methylchloroisothiazolinone, Ethylhexylglycerin, Magnesium chloride, Polyaminopropyl biguanide, Methylisothiazolinone. Aqua (Water), Glycerin, Cetyl alcohol, Aluminum starch octenylsuccinate, Hamamelis virginiana (Witch hazel) water, PPG-15 Stearyl ether, Polylactic acid, Steareth-21,Alumina, Steareth-2, Cera microcristallina, Alcohol denat., Phenoxyethanol, Polysorbate 60, Salicylic acid, Potassium cetylphosphate, Xanthan gum, Hydrogenated jojoba oil, Disodium EDTA, Butylene glycol, Limonene, Benzoic acid, Citrus aurantium bergamia (Bergamot) fruit oil, Sodium hydroxide, Dehydroacetic acid, Linalool, Ethylhexylglycerin, Laminaria saccharina extract, Polyaminopropyl biguanide, BHT, CI 77289. Zeolite, Butylene glycol, Glycerin, PEG-8, Kaolin, Dimethicone, Prunus Amygdalus Dulcis (Sweet almond) Oil, Cetyl alcohol, PEG-150, Cera alba, Xanthan gum, Carbon, Commiphora myrrha oil, CI 77891 (Titanium dioxide). Aqua (Water), Alcohol denat., PEG-32, Ethoxydiglycol, PEG-40 hydrogenated castor oil, PVM/MA decadiene crosspolymer, Salicylic acid, Butylene glycol, Vaccinium myrtillus (Bilberry) fruit extract, Phenoxyethanol, Saccharum officinarum (Sugar cane) extract, Xanthan gum, Imidazolidinyl urea, Citrus aurantium dulcis (Orange) fruit extract ,Citrus limon (Lemon) fruit extract, Retinyl palmitate, Acer saccharum (Sugar maple) extract, Hydrolyzed hyaluronic acid, Tocopherol, Sodium hydroxide. Aqua (Water), Aluminum starch octenylsuccinate, Butylene glycol, Ethylhexyl stearate, Glycerin, Alcohol denat., Niacinamide, Dimethicone, C12-15 alkyl benzoate, Phenoxyethanol, Glyceryl stearate, Acrylates/C10-30 alkyl acrylate crosspolymer, PEG-100 Stearate, Tocopheryl acetate, Panthenol, Xanthan gum, Salix nigra (Willow) bark extract, Cetearyl alcohol, Disodium EDTA, Sodium hydroxide, Amorphophallus konjac root extract, Limonene, Ethylhexylglycerin, Vaccinium myrtillus fruit extract, Epilobium fleischeri extract, Anthemis nobilis flower oil, Saccharum officinarum (Sugar cane) extract, Potassium sorbate, Citrus aurantium dulcis (Orange) fruit extract, Citrus medica limonum (Lemon) fruit extract, Citrus grandis (Grapefruit) peel oil, Acer saccharum (Sugar maple) extract, Linalool. The product can be purchased on their website or at selected Boots stores. A nice simple face wash that doesn't try out my face too much after washing. I noticed the smell is very pleasant as well, florals but not sweet like roses. It rather reminds me of lavender. It doesn't foam up with too much bubbles which I like because I find when that happens, it tends to dry out my skin too much. This wash keeps me nicely moisturized. I like using this after I already removed my make up, just to clean my pores and remove any last traces of cosmetic lingering around. The refiner has a consistency of a gel cream, I like that it's not too thick so that it makes it easy to spread on the skin. The ingredients are great for the skin, for instance, it consists of Witch Hazel to minimize the appearance of large pores and Salicylic Acid to help clear and prevent breakouts. In terms of the exfoliating element, the product has micro blue beads which are low impact compared to the Skin Food Black Sugar Mask but they do not dissolve and you can continue to gently massage your face until you think it's good enough to stop. I use about half of a pea size every 3 days and it lasts me close to a month. This is actually the second time I received this mask, the first time was from Yinnie for my love package posted here. The mask is pretty fun and one pack is good for about 3-4 applications. I apply it on my damp face and the mask activates the second it touches water -- it gets heated! It's sooo relaxing especially after a long day at work! I think that this serum barely works on me, one being that when I do get pimples, it's a freaking volcano so this wasn't strong enough to help me. Other than that, I don't really get pimples now so I can't really comment on this. I find this is a great summer moisturizer for oily skin. For me, I prefer something more moisturizing and I like a bit of shine instead of the matte. Overall, it absorbs very quick and acs well as a primer before make up application. Whoa! That's a long review! 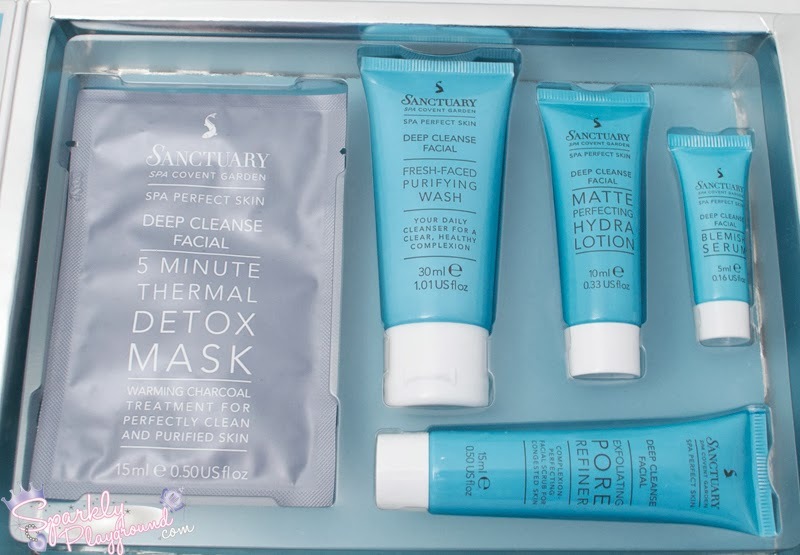 I think this gift set is fabulous for me to try out a range of Sanctuary Spa products without having to buy everything full sized! Especially when I reside in Canada, I actually have no access to get my hands on this brand so this is just super fun to test out! The price seems to be reasonable as I know each full sized product ranges from £8.99 to £20. Thanks again Amber, love you loads!!! Packaging: 5/5 ♥ Beautiful and makes a great gift!